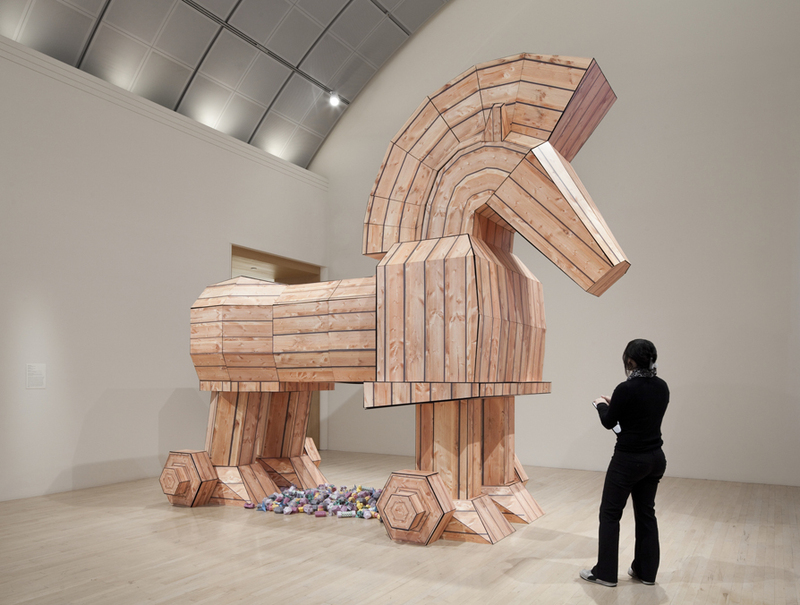 Gift Horse, (2010), is a 13-foot high sculpture based on the mythological Trojan Horse and clad with digitally-printed wood textures to resemble a 3D model in real space. Using the metaphor of the Trojan Horse as computer malware, its hollow belly was filled with hundreds of small paper sculpture viruses - from real viruses, such as Rabies, to famous computer viruses like the ILOVEYOU virus to imaginary viruses including Cooties. On September 18th, 2010 the Gift Horse was wheeled from the 01Sj Biennial to the San Jose Museum of Art and in a public ceremony the viruses were unleashed into the museum. Michael Silverberg, “Creating Digital Worlds of the Future”, Fast Company Magazine, New York, Sept, Page 24.